Wake up every day to endless mountain views and relax every night with a breathtaking sunset! 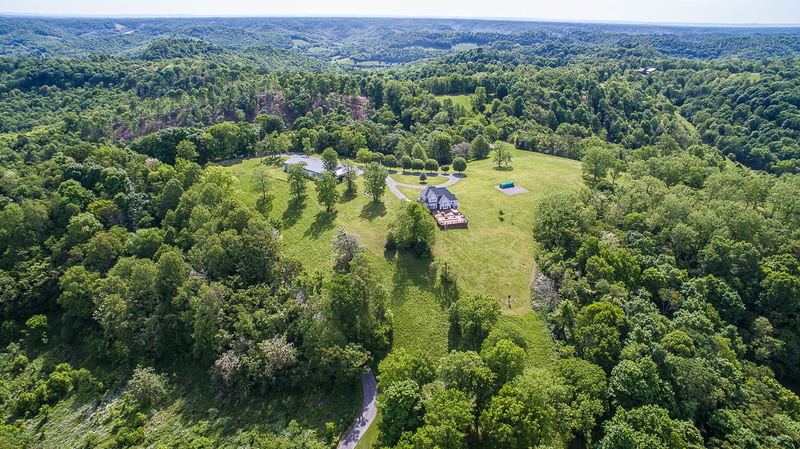 Beautiful 107 acre Liberty Star Ranch provides an extraordinary 360 degree view of the TN valley and mountains while being home to an abundance of whitetail deer and wild turkey roaming the grounds. Throughout the property there are 4 ponds, multiple horse and hiking trails, and many cleared 4 wheeler paths. The property is partially fenced and cross fenced with approximately 60% grazing pastures and 40% woods. The property also has at least 3 additional, prime building sites with electric and water available. These sites offer panoramic views, road access, and easy connections to both water and electricity. The backyard boasts a 2000 sq. ft. 4 level large wrap around deck with an extensive outdoor kitchen and large hot tub. While in the side yard you will find a large 'park' area complete with 250 sq. ft. greenhouse and 2 (150 yard) golf pins perfect for working on your short game. Additionally, there is a recently constructed 40 x 18 RV building adjacent to the garage that has 50 amp service with access to dual 200 amp electric service. Property has a state of the art camera and alarm system already installed. The 5000 sq. ft. garage has a separate Jimmy Malone Rd. commercial address with existing office space and bathroom ready for a home business. The garage space is fully accessible and could easily accommodate any full scale business, retreat/conference facilities, sports activities, or whatever your specific needs may need. There are (6) extra-large overhead doors, floor is poured 6” concrete and the facility is fully plumbed with a high pressure air system. And with property this beautiful, of course you would want to invite guests! Private 'Bunkhouse' guest quarters with full bath and separate entrance is fully furnished and attached to the garage. No water bills! The property is fed by an underground, natural spring that is completely filtered as it is pumped to the house. Separate septic systems service house and garage facility. City Water is also piped in and available. Extremely, mild temperatures throughout the year coupled with being only 15 minutes from beautiful Center Hill Lake make this a dream property. This private compound is located only 30 minutes SE of fast-growing Murfreesboro and only 1 hour SE of downtown Nashville. Close access to numerous grocery, specialty food/clothing stores, many popular 'box' stores, fitness facilities, and too many restaurants to list. Quick access, within 8 minutes, is also available to a newer regional hospital and doctor's offices. Educational opportunities abound with Division 1 Middle Tennessee State University only 30 minutes away; as well as, several community college campuses located nearby. With only 45 minutes to Nashville International Airport, this is an outstanding centrally located ranch. Clearly, there is a reason so many Country Western celebrities own ranches in this area! All of this, with a million dollar view, is priced to sell at $625,000. Property is shown by appointment only. Prior to viewing this property, the buyer needs to be pre-approved or provide proof of funds. Water Source: Spring and city water available.